"Pleased to meet you! I am Cali Mae. I am a beautiful, petite Calico with an interesting purrsonality. My previous owner was very upset that she had to surrender me, but her son had severe allergies to many things, and sadly, he was allergic to me." "When I first came to Wayside Waifs, I had a hard time adjusting to such a different environment. I was very stressed. So, I was moved into a staff member's office. Well, let me tell you, what a difference that made for me! I could walk around, stretch my legs, play, take naps, curl up on a lap. It is almost as good as being in a home. Almost. I love everyone that is taking such good care of me, but I really need my own home. So, what kind of home and family am I looking for? I need an experienced cat owner, and by that I mean someone who not only understands cat behavior and signals, but respects them. I need a calm, quiet home. The less stress the better, and who wouldn't want that? Also, no dogs, please. I will need time to adjust to my new home, so if you can give me my own room (not too small, I don't like feeling confined) I would appreciate it. The first thing I will want to do in my new home is to investigate it on my own, so feel free to run errands, catch up on a TV show while I am exploring. I need time to bond with you, too! I love to play, especially with wand toys, but I will chase after a toy mouse if you toss it around for me. The most important thing for us is to build trust with each other. Once I am feeling comfortable in my room, we can start to work on this, ok? Once I fully trust you, I completely relax and blossom into the sweet cat I am. So, if you are looking for a sweet, playful, quirky girl - come meet me! 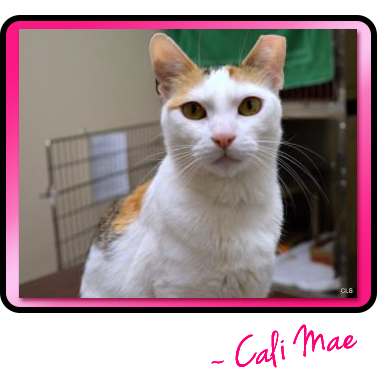 Miss Mae is waiting for her forever family at Allie's Alma Mater, Wayside Waifs. That's so cute about her liking money. So funny! Callie looks like a sweetheart! BTW, my human just wants to say she was allergic to EVERYTHING when she was a kid... so her parents put her through a series of allergy shots. This lasted for most of her grade school days and she thinks it is one of the few right things her parents did! They always had cats, and a dog too, and never considered giving them up.